If you were thinking that Goa is all about white sand and plenty of sea, think again! Very few tourist destinations can offer the disparate experiences that Goa can. When you have had your fill of the sea, it’s time to look ahead to the hills of the Western Ghats. 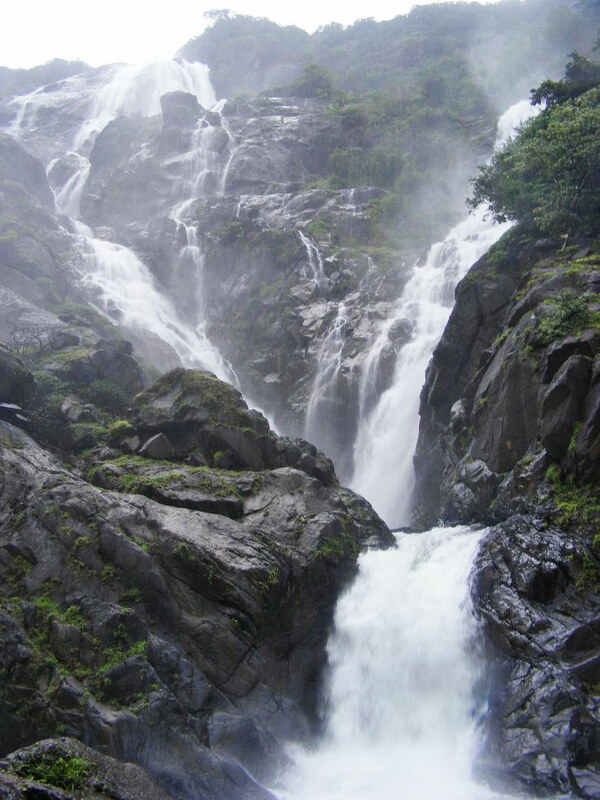 The Dudhsagar Waterfalls is luxuriously enveloped in greenery and a breathtaking avalanche of milky white water. The word ‘dudhsagar’ literally means ‘ocean of milk’. The waterfalls are so named because of the white foamy water that comes down from a staggering height of 2000 feet above the sea level. Dudhsagar waterfalls are the tourists hotspot because of its sylvan surroundings. The falls are located amidst the blissful tropical jungle. Lots of naughty monkeys can be spotted on the forests tress climbing, jumping and playing among themselves. 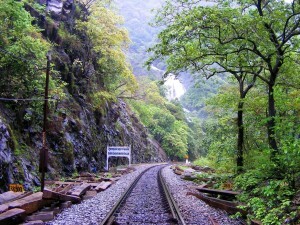 Dudhsagar waterfalls is the popular birding site among the tourists. You can carry the binoculars along with yourself to indulge in bird watching. You may notice lots of species of butterflies and bees at this place. Apart from the birds and animals the region holds the rich aquatic life. While you are at the Dudhsagar Waterfalls, a visit to the Bhagwan Mahavir Wildlife Sanctuary can not be missed. It is the largest wildlife Sanctuary in India. The main attraction of the park are Royal Bengal Tigers, Barking deer, Blank Panther, bonnet macaque, common langur, civet, flying squirrel, gaur, leopards, mouse deer, pangolin, porcupine, sambar, spotted deer, wild boar and wild dog. 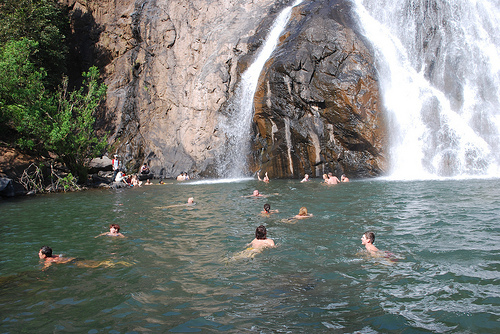 Tourists can indulge in swimming in the pools created by the fall. Swimming at these pools is extremely delightful and safe too. The water is really climb. You can even try to climb the head of the falls through the bushes falling into the pools. During the monsoons the falls become much more lively and active. The natural beauty all around the Dudhsagar Waterfalls has also made it a popular picnic destination among the tourists. 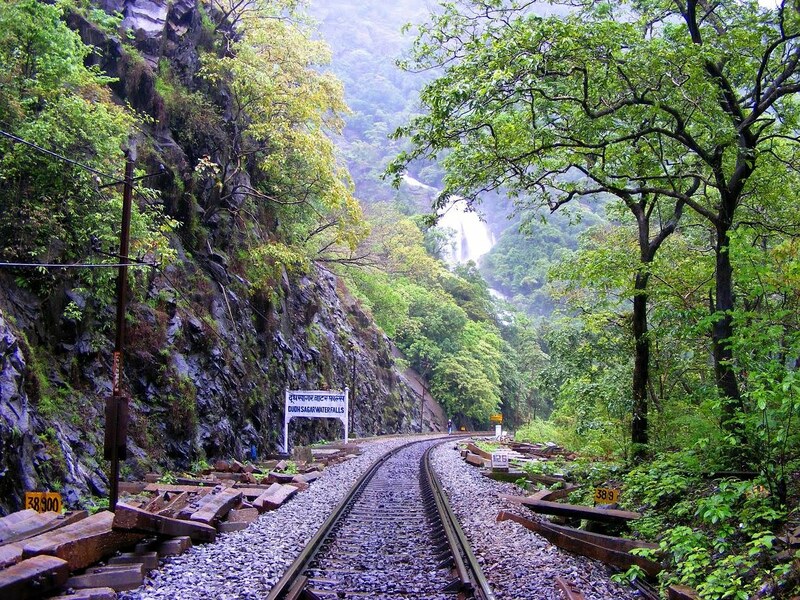 Dudhsagar Waterfall is famed as the trekking destination. It is the trekkers paradise. Tourists are recommended to wear the comfortable clothes while trekking. It is good to carry the rainy coat along with yourself. The trek passes through the lush forests, giving you the opportunity to have encounter with the wilds. You can capture the beautiful sceneries of the environment in your camera. You will be fully entertained with the calls of the jungle. You can even feed the monkeys with the bananas on the way. Beware of the poisonous snakes on the treks which could be dangerous. Otherwise trekking here is quite a fun. You can very easily reach Dudhsagar waterfalls by hiring a taxi or a bus from Panaji or Margao. The ideal time to visit the Dudhsagar waterfall lies after the monsoons, from the month of October till December.